Does 'Strange Planet' Creator Nathan W. Pyle Oppose Abortion? - Truth or Fiction? Does ‘Strange Planet’ Creator Nathan W. Pyle Oppose Abortion? 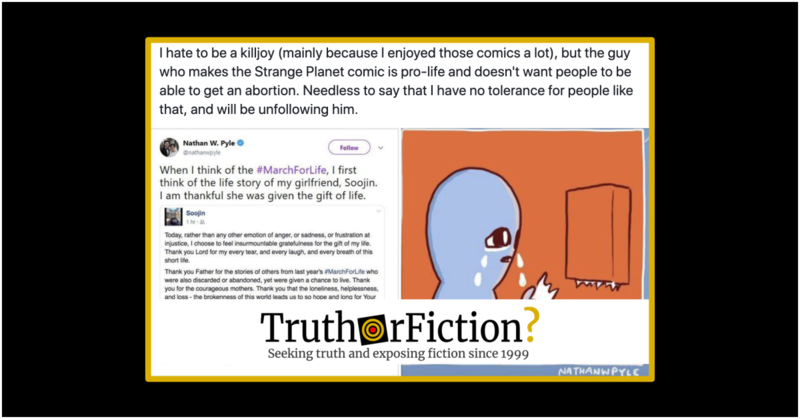 A Twitter user declared that “Strange Planet” creater Nathan W. Pyle is anti-abortion, but there isn’t much evidence to support it. Nathan W. Pyle of the popular "Strange Planet" webcomic opposes abortion. When I think of the #MarchForLife, I first think of the life story of my girlfriend, Soojin. The person who found Pyle’s 2017 tweet did not explain how or why they came across it, and its popularity quickly populated Twitter’s standard search query form. However, a search of all tweets from @NathanWPyle on April 8 2019 did not return any results relating to abortion. The #MarchForLife hashtag only returned the result above. The tweet is legitimate, and remained live on Twitter as of the day it was reposted (archived here). However, it appeared to exist in a vacuum, with no additional information suggesting that Pyle was vehemently opposed to abortion and no context around the circumstances of the situation Pyle referenced were available in the original 2017 tweet. Don’t expect to be able to escape the Milkshake Duck, however — the whole point of the Milkshake Duck is that it’s coming for us all. We’re only halfway through December: There’s still plenty of time left in the year to unearth 2017’s biggest Milkshake Duck yet. In 2017, Pyle once expressed his gratitude that a single individual in his life had been born. Without context for that statement, it is impossible to class the entirety of his views. And even if Pyle personally opposed abortion, that was not evidence that his personal opinion matched his political stance. Pyle has not yet responded to the controversy; we contacted him to ask for clarification and have not yet received a reply. Did Pat Robertson Claim He Had a Vision of Jesus with an AK-47 in Camo, Signaling the Second Coming? Were 2019’s First Three House Bills for Impeachment, an Electoral College Ban, and Foreign Aid? Did Free Birth Control in Colorado Drop Unplanned Pregnancies by 40 Percent? Guardian Angel Crying at the Cradle of an Aborted Fetus? American Sign Language for the Word ‘Abortion’?